I love the Runaways. So Cherry Bomb was the obvious choice for this post. Despite my rock loving roots, this has come out nice and sweet and 1950s cute if you ask me. That makes me happy too. For some reason this cherry print polka dot cotton makes me think of American diners and blue denim. I’m rather gutted I couldn’t have a milkshake for this photoshoot. Am I crazy or do you get USA vibes too? I feel like running around town singing Bruce Springsteen songs or maybe bake a cherry pie. The fabric was won many moons ago thanks to a giveaway by the Vintage Nirvana that is The Polished Button, and delightfully hosted on the famous blog Handmade Jane. 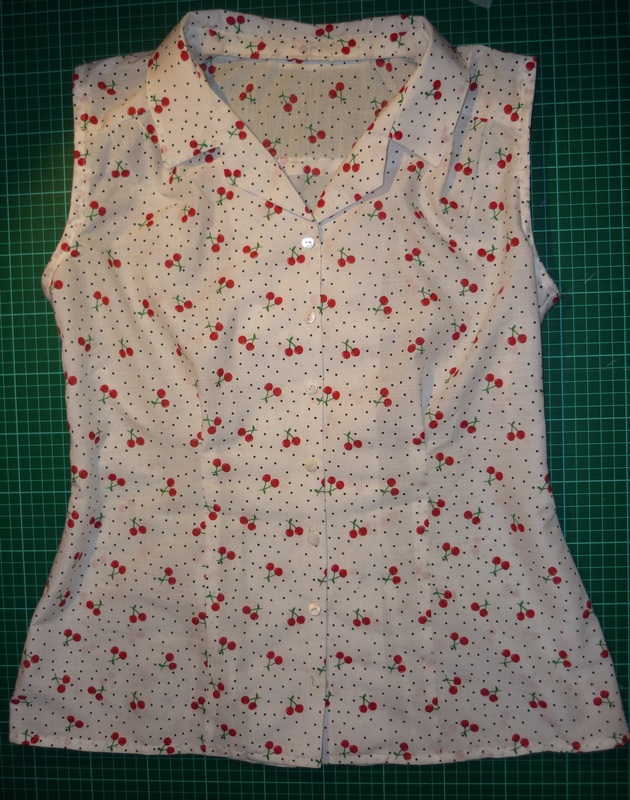 I won 1m of the cotton AND 1m of matching cherry print bias binding which I put to good use as an armhole facing. I made this blouse last summer but during a strop over the notched collar I put it in the UFO bin — BANISHED. It was my first time trying a notch collar you see and I was having some difficulty. When I tried more recently on my pyjamas it worked a treat so I was clearly hot and bothered over nothing. But now, I’m ooooh sooo smug about how Summery I look. The blouse is a mix of Simplicity 1880 a hit from the Project Runway pattern line and the Sassy Librarian Blouse. I used the collar plus the front and back yokes from 1880. Then the release pleats and length from the Sassy Blouse. 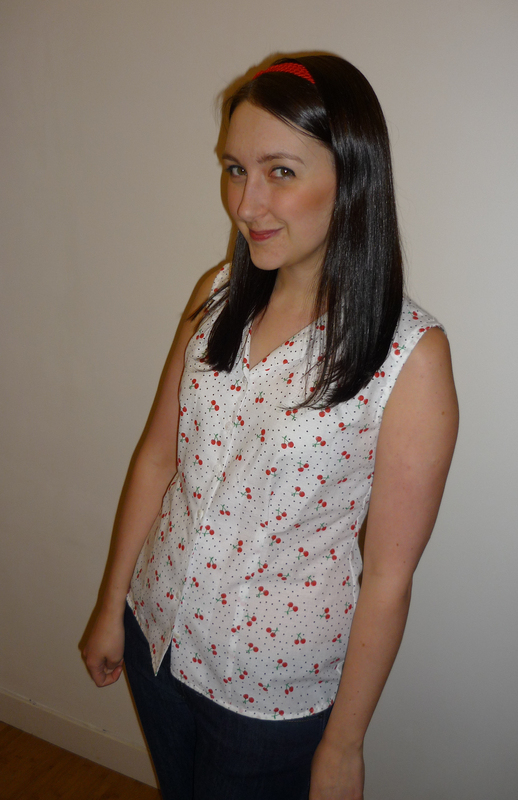 If you want to see some cherry print awesomeness on a SL Blouse, look no further than Claire’s fruity version. 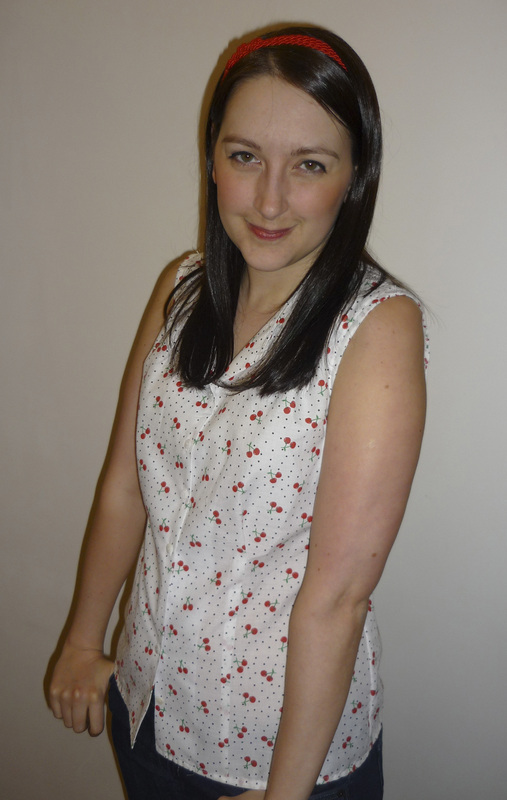 Or if you’re really after another version of 1880 cropped as a blouse, take a look at Amy’s mad men inspired look. So what about you? Are you breaking out the summer sewing patterns? Daring to bear some leg or arm now the sun’s staying out longer? This is so cute! It’s very, very summery! Sadly, it’s still crazy cold here, so I’m not able to wear summer clothes yet, but I’m really looking forward to it! Sidenote: your hair is so shiny and gorgeous!!! 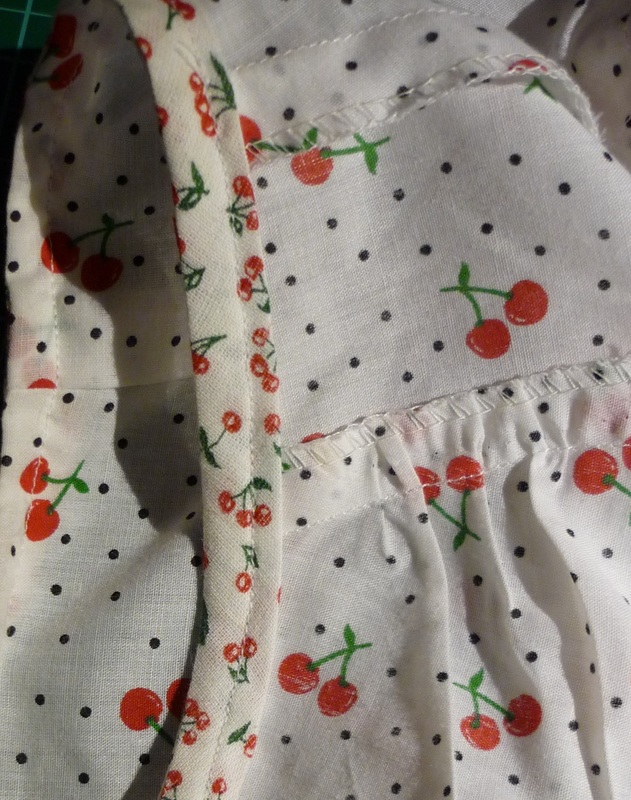 Sweet blouse, and cherries on the binding too! I have not tried a notch collar before, but I’m glad that things got easier after some time and your collar turned out fine. Thanks! Notch collars are a little puzzling but give a great eureka moment!! Cute – and yes, totally getting the American vibe. You look all sweet and innocent in these photos – bug hiding a deep, dark secret underneath! Very I Know What You Did Last Summer…! I’m getting a very strong spring vibe from this blouse. It looks lovely and a great mix of patterns. Glad the collar worked out. SPRING! Let’s hope with the daffs popping out and a break in the rain, that spring might be here to stay. Thank you! God I hear you. Walking around with bare arms and legs seems like a lifetime away! Ooh a clever mashup! Love the collar. And YES to baking pie- this needs to be done!! So cute Amy and I love how the collar has turned out. It’s hard not to start thinking about summery sewing when the sun comes out. I have a couple of things on the go that will be just right for warmer weather – but really need some summery knits too!!! So super summery! Check you out! this is lovely on you. It’s such a sweet make 🙂 nice combining. and in answer to your question I’m making some v short things at the moment. Aww thanks! I BET YOU ARE making short things. You would never let the weather hold you back lady! Very sweet! And your notched collar looks perfect! Cherry Bomb is the perfect name! Yay! Thanks! So glad it turned out alright in the end. Cute! What great fabric. I get the 50’s USA vibes too! Love it! What a great pattern mash, and the cherries are fab. Thank you! Cherries are so much fun to wear. I highly recommend it. Impressively sweet and spring-summer esque. Those button holes and collars make me green with envy. One day! Love it. Heehee. You say butter wouldn’t melt, my friend called me a “12 year old”! That blouse is so damn cute! It looks great on you! I love this blouse! It’s very summery indeed and that fabric is so cute. Bring on the warm weather!! Thank you! Let’s cross fingers and toes for summer to come along. That is super cute and I would be smug too with a fabulous top like that in my wardrobe!! When the weather gets warmer it would be great with some denim capris and red wedges and of course, that milkshake! !